After the foggy day last week we had a very cold, clear, frosty day. 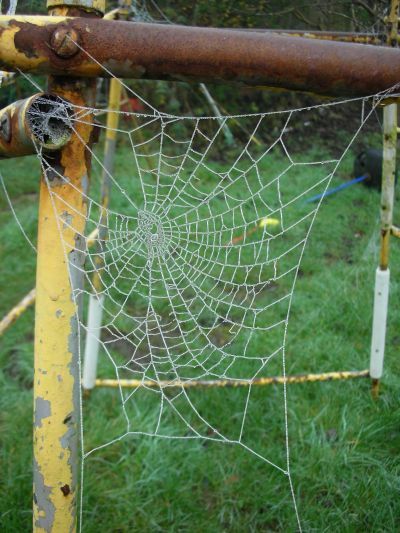 Despite having a nasty cold and losing my voice (to the kids’ relief) I ventured outside to take photos of the spiders’ webs on the climbing frame. I love the intricacy and fascination of these lacey structures. I love the contrast between the webs and the rusty, delapidated climbing frame here and the peeling paint. 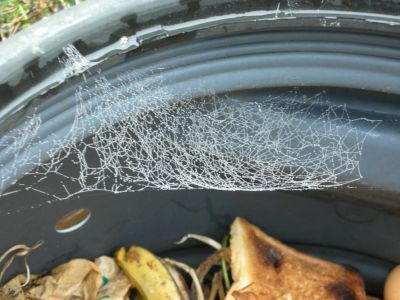 This one was inside the compost bin – its structure is a bit different than the others. Happy Christmas to everyone! I’ve been watching films all afternoon – Flubber from a video followed by Peter and the Wolf on Channel 4 and then we brought the presents downstairs and put them under the tree – I don’t let them do it earlier or little fingers would sabotage them…. All I’ve got to do now (I think!) is to put custard on the trifle. Tomorrow we will open our presents as soon as I’ve got lunch ready and then go to church. For lunch we have duck and the usual roast potatoes, sprouts, carrots, parsnips etc. Cranberry sauce if I remember to put it out! In previous years it has languished in the cupboard all day… Christmas pudding with brandy-laced custard (lots of brandy!) for pudding and trifle, Christmas cake and sausage rolls and stuff like that for tea, if anyone wants any tea after that lunch. It is just us and the kids tomorrow and then we will go up to Stoke to see my parents later in the week. These can’t be real!! I have never seen such gorgeous (or huge) webs. thanks for sharing. Happy, healthy, creative New Year from me to you. Hello Liz and a Happy birthday to you, I know we can relate to the Dec. BD LOL..
Wow, they look almost beaded! 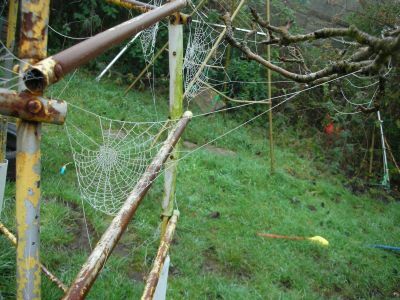 Love the spiderwebs! 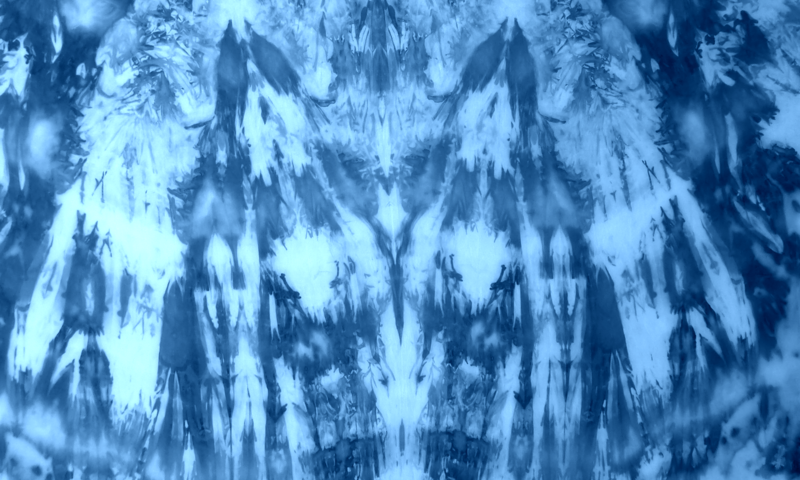 Great pics – any hints on photography? 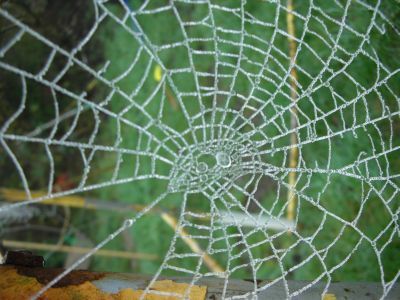 I’ve used webs as quilting motifs several times. Maybe it is time to go back and do another! Smashing webs. Those spiders down in South Wales must be huge! 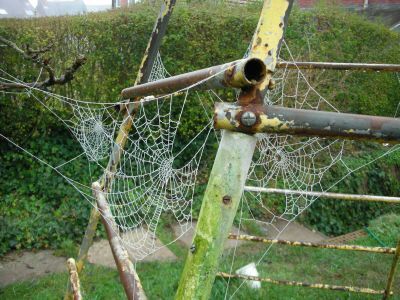 Great spider webs!! As a crazy quilter, I love spider webs and these are spectacular… thanks so much for sharing! Happy Christmas! Why can’t I see the pictures? I can only see a written list.